If you are interested in DJing at the Bailonga, we’ve got a list of basic guidelines to follow. If you’re new to DJing, read on past the basic guidelines and DJ etiquette for info on how to get started. 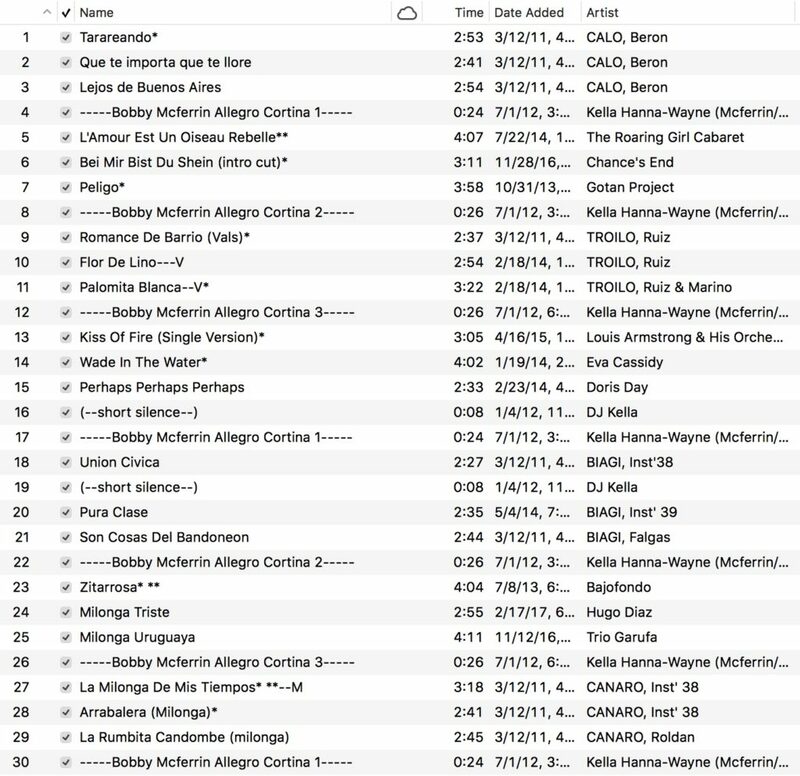 Bailonga’s default form of DJing is 50/50, alternating between traditional and alternative/nuevo tandas through the evening. Our emphasis on alternative means that we require a high level of danceability and responsiveness to the dancers in order to keep people engaged and maintain good technique. We host one night of all traditional music a month and very rarely host alternative-only nights. Tandas by default are 3 songs. Exceptions: An alternative tanda with two very long songs, or 4-song tandas for traditional night. Alternate between traditional and alternative/nuevo tandas, starting with traditional to help the beginners get comfortable. Straightforward danceable movement in first few tandas to help beginners learn. Beyond that, play good music, trust your judgment, be open to feedback afterward, and it’ll be great! Be on time. Be ready to go when the lesson is over. Keep your set within the time limit allotted for you. The lesson frequently goes 5-10 minutes late, so expect your set to be around 2 hours and 5 minutes long. If your set goes over the time or is running late, check with the organizer. Be prepared to change your set length if necessary. If there’s a live musician playing, find out when they are playing and for how long. Contact Kella to get a set list from the musicians to avoid any song repeats. Be prepared to be flexible with your start and end times when DJing around live music and communicate with the organizer and the musicians about when those transitions will happen. Be open to feedback! We want a consistent and high-quality standard of music, and this means all repeat DJ’s need to be open to outside perspectives. For new DJ’s, we require that a minimum of your first two sets be vetted by Kella. Be prepared and flexible for additional meetings after the first two and continued feedback over time. Before you make your set, read through these guidelines, and talk with Kella about how to get started. As a DJ, your top goal is to make the dancers happy, comfortable, and have excellent dances. The more invisible you are as a DJ, the better you are doing your job. If you are a new DJ who is low on standard music (or a regular DJ who wants more stuff,) feel free to contact other DJ’s in the community to see if they would be open to sharing some of their stuff. 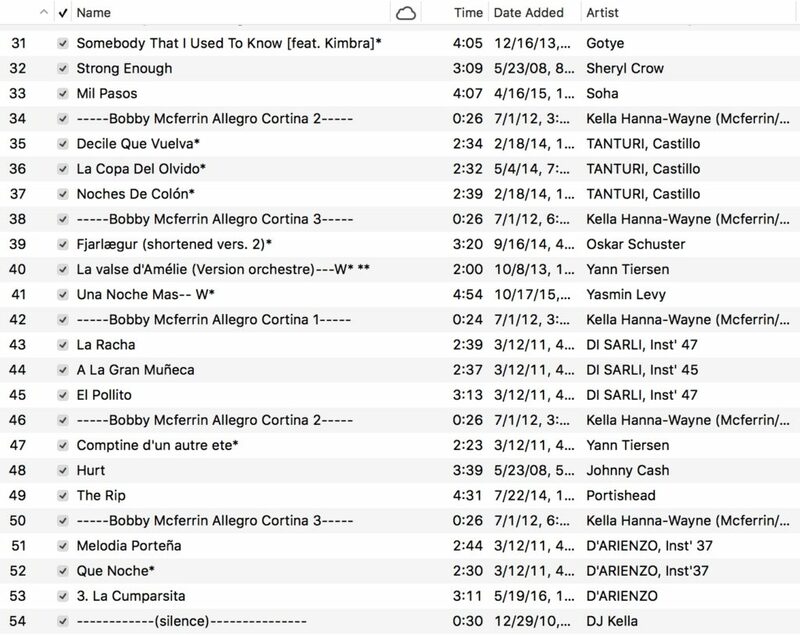 Kella keeps a playlist of Bailonga standards that she can share with you. The vast majority of music played at Bailonga is stuff people have heard before. Every DJ has their go-to songs and styles, but the more familiar music you play, the better. It’s exhausting, especially for leads, to dance to music they’ve never heard before, all night. If you are trying to decide if a song is tango danceable, dance to it, either by yourself or find a partner. If you’re still not sure, pretend you are a beginning tango lead, and limit yourself to an easy walk, forward, backward, side steps, and ochos. If you feel comfortable dancing like that, and there’s potential for making things interesting, then it’s a danceable song. If you can only make it interesting by using advanced moves, other people may have trouble dancing to it. Avoid songs that are longer than five minutes, and make sure any song of that length or longer is worth the extra time. Be prepared to DJ songs that you aren’t as fond of but that are standard in the Bailonga community or good for dancing. Be prepared to set aside songs that you are in love with but are harder to dance to or don’t fit in the set. We serve the community first, our own musical tastes second. In Traditional tango, tandas are grouped by orchestra name, year of the instrumental or the vocalist, and by overall type of movement. In Alternative Tango, tandas are designed in a similar way but come in a lot more shapes and sizes in part because mixed artists within the tanda are normal. Group songs by the motion they cause in dancing and the mood they evoke in the music, ie: swinging, romantic, accented, sharp etc. There are different ways of finding which songs fit together. A good way to do this is to get up and dance to songs and see if the motions you make are similar. A good formula for building tandas if you are otherwise stuck: the second best song should be first, the weird or experimental song should be second, and the best song should be last. Tandas are like vectors. They have a direction: increasing the energy, decreasing the energy, or maintaining the energy. Assemble these vectors together to make a cohesive energy arc. Easier to dance tandas should be consistent in the beginning of the night, when there is a higher amount of beginner dancers. Later in the night, more advanced dancing tandas and experimental songs can be added in. Use variety. Mix up styles of music, energy levels, orchestras, and types of movement from tanda to tanda. When you have your set vetted, bring extra music. Make sure you have alternate songs or tandas, in case changes are necessary. When your set goes live, watch the dancers for immediate feedback. Pay attention to how many people are dancing, what songs get them to stand up, what type of dance they are having, and what emotions they are expressing in their dance. Especially watch the people who only dance a few times a night. The following is an example of a standard set at Bailonga. We appreciate the time and effort you put into DJing! DJing is hard work and we couldn’t exist without it.